A combine pulled by the famous McCutchen horses, brought originally from the homeplace in Yacolt. The most famous of the horses were the sorrels (a beautiful red-brown). Notice that these horses are not the big heavy animals one often equates with draft horses. McCutchen horses could be used for saddle or work horses. 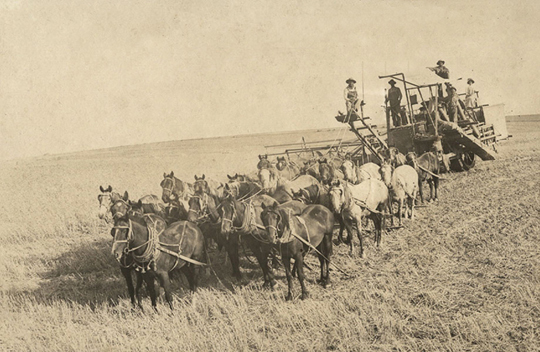 Combines were often pulled by as many as 32 horses and/or mules. The people here are the McCutchen brothers, (probably Bill, George, Ed and someone else) and one of their wives.